You know how I love red lipstick, high heels, and big hair–the mark of a true southern lady. My grandmother Norton must have put on her red lipstick every morning as she opened her eyes. I can’t remember ever seeing her without it. I just loved it then and I love it now. I was going through some files the other day and ran across a newspaper clipping from November 2002. It was the press release on Michael Marcus creating a red lipstick called Southern Lady. When I first met Michael he was coming to Birmingham for the launch of his skincare and makeup line at a local department store. He was swamped like a rock star, as women were going crazy about his line of lipstick. Southern women love lipstick. It was a time when brown lipstick was the rage and the young girls had embraced it, but the women with a little more “maturity” were longing for color. I managed to reach through the crowd and hand him my business card and screamed, “let’s talk.” Of course he thought I was a crazy, but when we finally had a moment, I introduced him to Southern Lady Magazine, and discussed my thoughts on how his wonderful products were perfect for our readers. 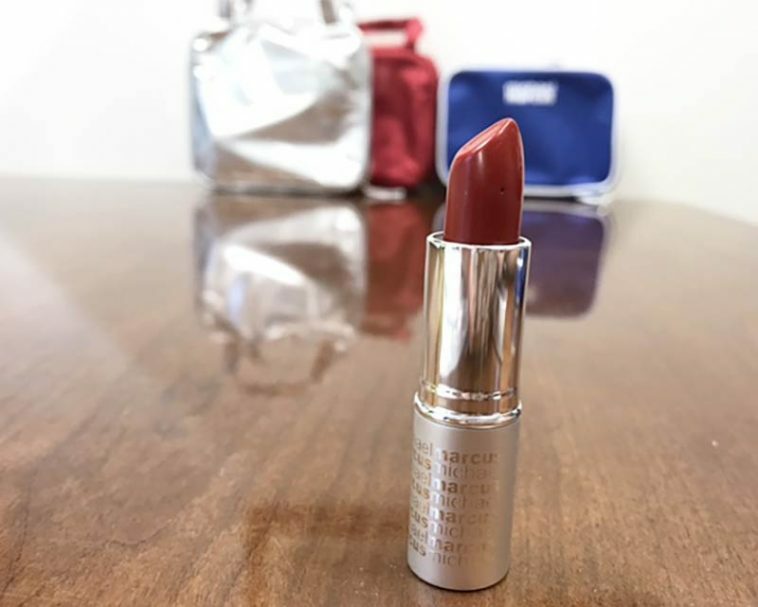 Several months later, Michael introduced Southern Lady lipstick, which is still in his line today, along with Phyllis lipstick (a golden red/bronze). After all, we need many shades of red. I spoke with Michael last week, and we were reminiscing about the past 15 years since that day. Michael was a featured speaker at our Southern Lady Celebration weekends and everyone adored him and the valuable information he shared about makeup and skin care. He has also written many articles for the magazine on beautiful makeovers. So, we are celebrating his international success today as well as our 15-year friendship, with Michael giving away 3 packages to 3 lucky Ribbon readers. Red Makeup Bag contains the travel makeup brush set, Southern Lady Red lipstick, and eye treatments. Silver Makeup Bag has the body and face treatments, along with Southern Lady Red lipstick. 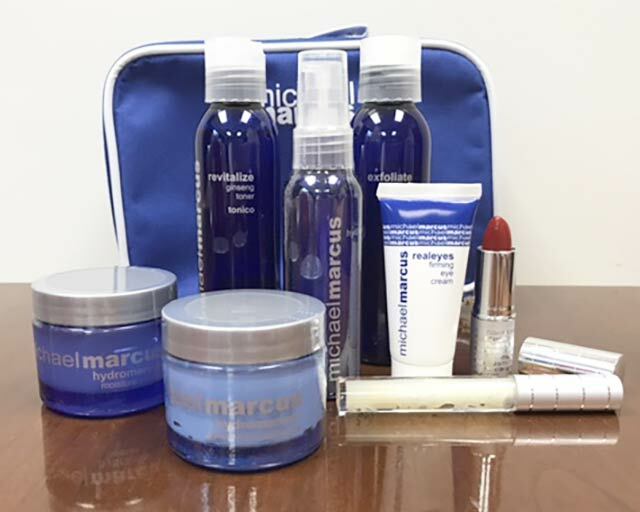 The Blue Bag has his hydro-marine collection of face treatments, lip plump, and Southern Lady Red lipstick. These makeup sets are valued at over $500. For more information about his products visit michaelmarcus.com. Thank you Michael for your creativity in developing products for us who love color. Enter for your chance to win below, and good luck! This giveaway ends Thursday, July 13th, at 9 a.m. (central time). Congratulations to our giveaway winners Joy Wood, Joy Goreham, and Christy Wendell! Wow! Just hearing about him. Sounds great and I would love to try it! Thanks for the opportunity to win! I’m not Southern, over twenty years of nursing ruined the joy of heels, but, as I’ve gotten to “a certain age”, I am wearing red-er lipstick, and I would love one of the gifts. thank you for the chance to win a gift set! I would love to attend another Southern Lady Celebration, again! My mom, sister and I had such a wonderful time at the last scheduled celebration! Love the lipstick colors! Would love to win and try more!! As you know I’m a yankee, yet my connection to you southern ladies has always been cherished! My feet won’t let me wear high heels anymore, but my hair remains big and my lips stay red! I HAVE to get my hands on Michael Marcus’s PHYLLIS red! 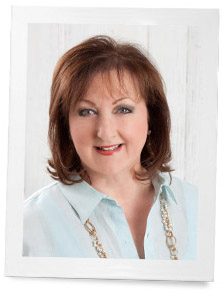 go to his website…..his lipsticks are glorious!!!! Red lipstick, big hair and high heels; OMG Phyllis we must have been separated at birth! In my 68 years I can never remember a day I didn’t put on my lipstick, makeup and “fix” my hair. It has helped me through some trying times and I looked like a lady all the while. I may not win the Red Lipstick package from Michael and you; but, I’m the real winner knowing that there are others like me that adore the crowning touch that only Red lipstick can give the heart and soul. God bless us as we unite in a simple pleasure. I am the same way!!!! Love red lipstick!! Red lipstick is a classic look for any Southern-hearted girl–wherever she may live! Thank you for the giveaways, Michael! My granddaughter said one time I know Meme is ready when she puts on her red lipstick. Would love to try southern lady red lip stick or any of Michael Marcus products! You will love all of his products. They are wonderful. I used them and love them. Every “Southern Lady” needs a red lipstick. I remember seeing Michael at a venue when he was just starting on his road to success. Would love to wear his again!! Love the opportunity to experience more of his products. Carol his website has a fabulous selection!! I love red clothes and the fantastic red lipstick color that goes with them. I would love to try Michael’s line of cosmetics including his amazing red! As A Southern Lady I Love Wearing Red Lipstick Everyday. I Would Be Delighted To Win A Giftset. Would you believe I’ve never worn red lipstick before–not even once! I don’t know why, though, and I love the color RED! My Southern mother died at 99 years old and was still wearing her red lipstick. How Southern, that at 99, she’d still be wearing red lipstick! Good for her. I have heard, and I tend to believe, red lipstick makes your teeth look whiter! Just be sure you go over them with your tongue before you walk out the door. Well, all I have to say is RED is the color that I have worn every since I was”15″ years old… I’m now nearly”72″… I don’t plan on changing. I belong to a “Tea Group”… I’m the OLDEST Lady of the group and several have asked about my RED lipstick. RED is the one shade everyone can make their own. Please enter my name in your drawing. I have lived in the South for “11” years but we are now back in Indiana. I have learned so much on how to enrich our lives with that special SOUTHERN LADY touch. I thank you for all your special SOUTHERN LADY influence on our lives. Amen to that! 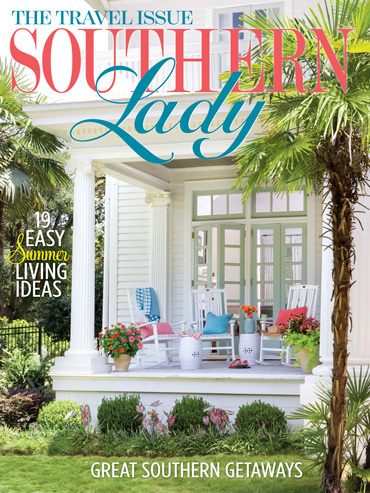 Southern Lady is a marvelous publication, enjoy articles, and the advertising is special. No fillers. I have had so much sadness in my life recently, a free gift with red lipstick could be a pick me up. I despertly need this. Our mom was a true and faithful red lipstick lover. The darker the better. Age is just a number and red is a color to enjoy for every age. Never one to shy away from color, in fact I love color in my home as well as on my clothes. I hope somebody will remember to put red lipstick on me in the casket at my funeral. I would hate to meet my maker not fully made up with bright red color on my smiling lips. As a Red head, I was always told that I shouldn’t wear red clothing or lipstick. I would love to receive one of these gift sets so I could prove all “nay sayers” wrong. Thanks so much for the wonderful chance to win. Then you would love Phyllis lipstick. It is a bronze red for redheads…..I love it. He made it for us girls with red hair. Mine is highlighted red, so it works perfectly for me. My daughter, Nancy, and I were at two Southern Lady Celebrations at Opryland Hotel and think Michael spoke at one of those. Those “Celebrations” were wonderful times together. I would appreciate winning. What a nice give away. Thank you Phyllis. I’d love to win Michael’s lipstick. The color looks like some of mine. So glad that lots of other women still wear red lipstick. While the more timid smear a bit of red on with a finger, I prefer it straight from the tube. Two rules for red lipstick. 1. Too Red and 2. Too Much, then blot lightly once. If you were giving a prize for the oldest lady still reporting that she wears red lipstick I’d win. I’ll be 86 in September. Everyone tells me not to ever stop wearing really red lipstick because it makes us happy. Red is our color…..I will never stop. I have always worn red lipstick love it. I am now 70 and still wear it. I’d love to win one of these fabulous packages! I have always admired red lipstick on other ladies, and even though I am a Southern Lady, I always felt it was too bright on me. I would love to find a shade that is right for me. I am blonde hair and hazel eyes. What a wonderful gift! Would be so nice to win! Mother’s go-to lipstick was always a blue-red. I have recently rediscovered red, but have yet to decide exactly which shade is “me.” Can’t believe I’ve never tried Southern Lady!! Red has always been my signature color of lipstick!!! I have never used Michael’s makeup line so I would love to try his red lipstick! NEED another celebration. With sewing vendors of course. And Kathy Mc classes. In Birmingham. Just saying. We all need some color after a certain age. Got turned onto red a couple years ago. I thought I could never wear it. Wrong! I love it. I love, love, love red lipstick! Would love to try either shade of red! Thanks for the opportunity! I would love to win the products. Send them my way…………. I am a huge fan of your publications and The Ribbon in my Journal. Would love to try the Southern Lady Red lipstick. I’m not getting older, just getting bolder! Would really really love to win. Thank you and Michael Marcus for this opportunity. Thank you Phyllis, I’d love to be one of the winners. I just love Southern Lady and all the beautiful photos. I live in NJ but absolutely love Southern hospitality and all the wonderful entertaining ideas from the magazine. Your wonderful post reminds many of us of our Southern grandmothers who never left the house without lipstick…usually red! I love Southern Lady magazine. I really enjoyed the article. My mother passed away in 2012 at the age of 94. I never remember a time that she did not have on lipstick. My mother is the one who introduced me to Southern Lady and Taste of the South. I love red lipstick.Red is a happy shade.Who does not want to feel happy. I love red lipstick.Red is a shade that makes you feel happy and who would not want that. I woke up a bit out-of-sorts and after reading this , I am brighter! Nothing is more uplifting than a post about beauty products. I want to try everything! Thank you for beautiful pictures and uplifting writing. I love the brushes that match the ensemble of red. I’ve never heard of this line, probably didn’t make it out to the west coast. I’ve had trouble finding a red lipstick that has enough color but isn’t too dark so that my lips disappear. Maybe his will work for me. Thanks for the information! ❤❤❤❤ Thank you for this opportunity. Oh Phyllis how I enjoy my Southern Lady Magazine and now your blog Ribbon in my Journal. I miss the Southern Lady Lady Celebrations and so wish we could have just one more reunion. I do remember Michael Marcus and the mini makeover one year at SLC when he spoke to our group. I love the “Phyllis” shade and would love to win any of the gift sets! Looks like a beautiful shade of red! Not sure how good it looks on me, I like the bronze red best. My Mother was born and raised in Arkansas and red was her color! Would love to win this beautiful set. Thank you Phyllis for your inspiring journal. Oh red lipstick make me feel beautiful! What a lovely post! You certainly know how to brighten our days with these delightful opportunities. Have never heard of Michael Marcus so I appreciate this introduction. I really hope one day you will write your biography as I feel you have been a wonderful role model and inspiration to women everywhere! I am a “mature” lady of 76 and my favorite color to wear is red. I got married for the 2nd time about 4 yrs ago and wore a red dress as the date was 12/7. I think mature women look better when they wear something bright and bright lipstick helps . I am not familiar with this product but I assure you I will look for it. Love your magazine; I think it is the best on the market for all of us who are fortunate enough to have been born and live in the south. I think it is like no other place on earth. Thanks Phyllis for all your work to present the south in such a beautiful way. Pick me! I love the story you shared. How innovative Michael Marcus is to design some shades based upon that encounter with you, Phyllis! I would love to win one of these. I never leave home without lipstick. Love the red and would very much appreciate winning one of the gift sets. Thanks Michael and Phyllis for a great giveaway! I love all of your magazines as well as all of your “ribbons”. 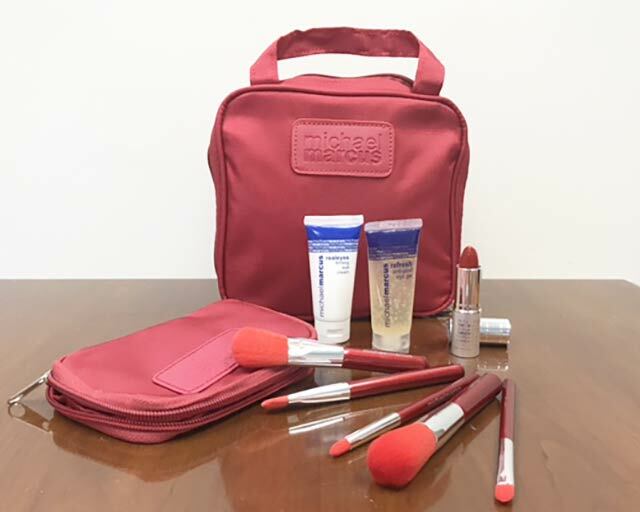 Would love the opportunity to win any of Michael’s products ! Thanks for the opportunity to win one of these bags, I do wear red lipstick even tho. I am from the north and have lived in many southern states really enjoyed GA. Happy inForida where we presently live. Lipstick is a must. (Just in case anyone needs a smooch.) Thanks for your column. Always informative and most times brings a tear to my eye. What a lovely prize! Thank you for the chance to win. I am a southern girl at heart – I live in Minnesota. I subscribe to all the Hoffman Media magazines and have many of your books. I LOVE red lipstick. My mom always taught me to wear lipstick as a young girl going off to my first real job. I was 18 then and I still carry on that tradition at 64. Thank you for this great offer. Wow! I was unfamiliar with Michael Marcus’s line, but am avidly checking it out. Thank you for show casing him and his beautiful products. And of coarse your generosity in the give aways, fun to enter such contests with a product we can pamper ourselves. I am very proud to be a Southern and love everything about the south. Like most southern women I put make up on every morning. Might scare others if I didn’t! What a wonderful line you have Michael. I love anything red. Thanks for offering your products to us Michael and Phyllis don’t every stop publishing your wonderful magazines. I tend to shy away from reds, but I really like this color. Thank you for sharing and this giveaway looks wonderful. Lipstick always and forever ! It is my everyday “go to” … I never leave the house without color on my lips . The instant pick me up . And I do have shades of red in my collection of many lipstick tubes and lip liners . I will be sure to search for Michael Marcus products . Lovely give a way! Thank you Michael and Phyllis! I love color. Thank you for offering this opportunity. Wow! I think I could use any/all of these. 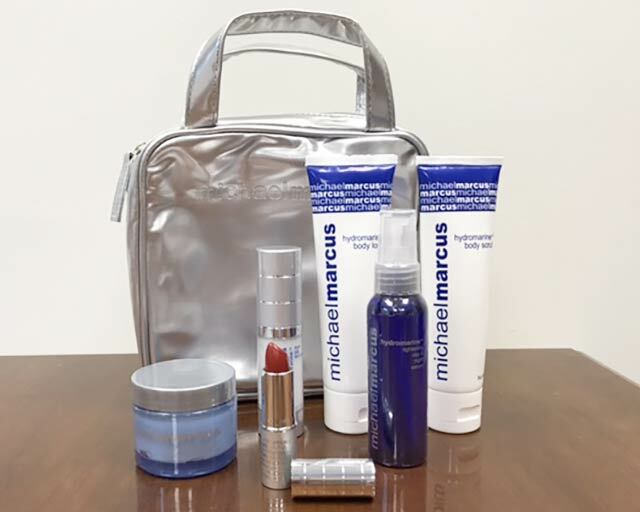 Thank you for offering a chance to win one of these gift sets. My favorite is a matte red no frost love it I can’t leave the house with out lipstick! I love reading The Ribbon In My Journal and would be thrilled to win a Michael Marcus gift set! Wow! What a great way to perk up a dull, rainy Thursday morning!